The 25-year-old musician, from Alford, Aberdeenshire, was named best British female and collected the best album award for her debut release, Our Version Of Events. Picking up the prize during the ceremony at London's O2 Arena, she declared: "This is a dream." Moira Milne, headteacher of Alford Academy, said the singer was proving to be an inspiration to students. 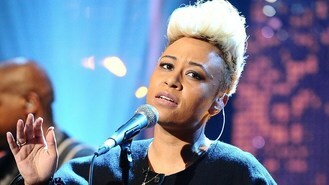 She said: "Her successes last night and over the course of the last year are just reward for the incredibly hard work Emeli has put in over the years. "We are all so proud of her... There is a great buzz about the school. "I know a few tears (happy tears) were shed by staff last night and pupils have said to me this morning 'Wow, she is such an inspiration to us. It's great to be an Alford pupil'. "She is a very talented lady and it is a privilege for us to have such close links with her."